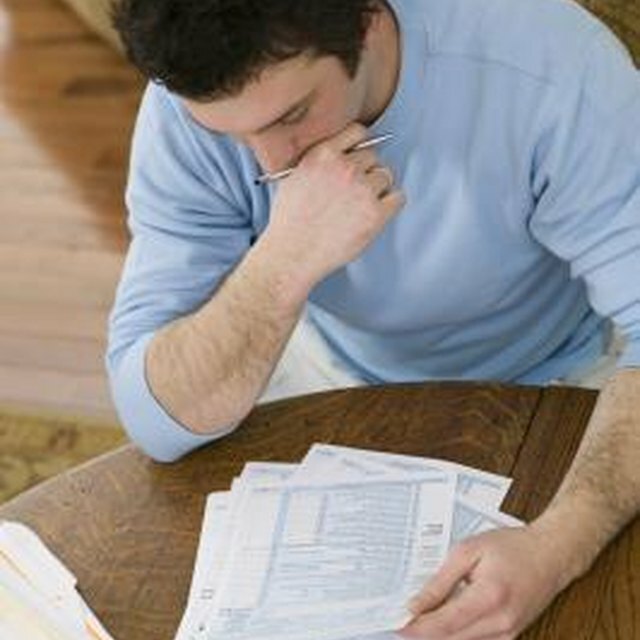 Your W-4 helps your employer figure your federal income tax withholding. If your W-4 is not properly filled out, your employer can withhold at the highest tax bracket of single with no allowances. By completing the form accurately, you can avoid underpaying or overpaying the Internal Revenue Service. Start by completing the Personal Allowances Worksheet on page 1 of the W-4. For example, claim one allowance on line A if no one else will claim you as a dependent on their tax return. On line B, enter one if you meet one of the three stated criteria, such as you are single with only one job. You may enter “1” or “0” on line C for your spouse. On line D, write your total number of dependents. If you will claim head of household on your return, enter “1” on line E. On lines F and G, state your allowances for dependent-care expenses and child tax credit, if applicable. Add lines A through G, and write the total on line H.
Fill out the Deductions and Adjustments Worksheet on page 2 if you will be itemizing your deductions or claiming credits or income adjustments on your return. To complete this section, you will need an estimate of your itemized deductions, adjustments to income and any non-wage income. To factor in the standard deduction amount, you will need the filing status you plan to claim on your return -- single, married filing jointly or head of household, for example. If you have more than one job, or you and your spouse are both employed, complete the Two-Earners/Multiple Jobs Worksheet on page 2. Use the chart included in the worksheet to determine the number of allowances to deduct based on your incomes. If the combined wages are high, enough taxes might not get withheld from your paychecks, even if you don’t claim any allowances. To compensate for the shortage, you can have additional taxes withheld. Use the worksheet to figure this extra amount. The last step is to complete the Withholding Allowance Certificate on page 1. Include your filing status on line 3. If you’re married but don’t think you will have enough taxes withheld, you can claim “married, but withhold at higher single rate.” On line 5, enter your total allowances, according to your calculations of the different sections. If you require additional withholding, put the amount on line 6. If you qualify for exempt status -- which means no federal income tax should come out of your wages -- indicate this on line 7. Give the completed withholding allowance certificate to your employer. Keep the other sections of the W-4 for your records. It helps to know how withholding works before you fill out your W-4. Your federal income tax withholding is based on the filing status and number of allowances that you claim on your W-4. Single filing status generally puts you in a higher tax bracket than married. The more allowances you claim, the lower your taxable wages and the higher your net pay. If you claim too many allowances, you will likely owe taxes. If you claim too few allowances, you will likely get a refund.